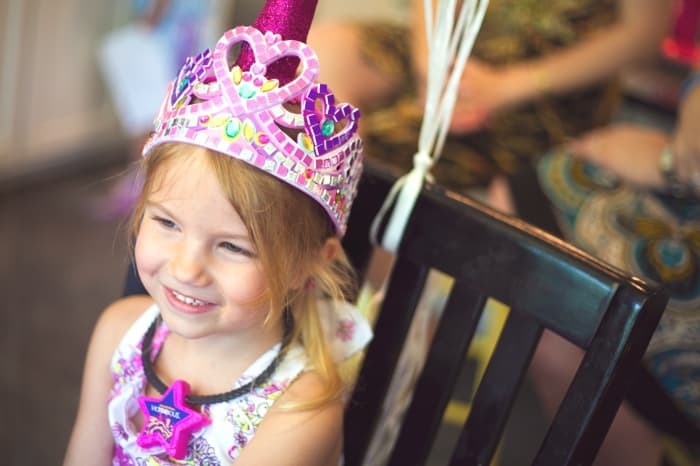 This past weekend was Clare’s 5th birthday party. 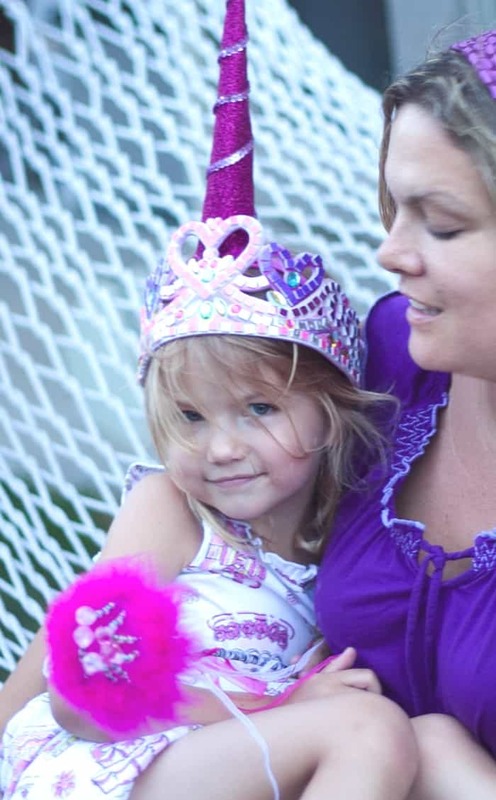 Her love affair with pink continues but we have moved on from Princesses… to Unicorn Princesses. So if you have a unicorn princess under your roof, you might want to take some notes. This was an insanely fun party and for the first time, Clare helped me with a bunch of the planning. That was the best part! Happy birthday big girl! I can’t believe I’ve been a mama for 5 years! 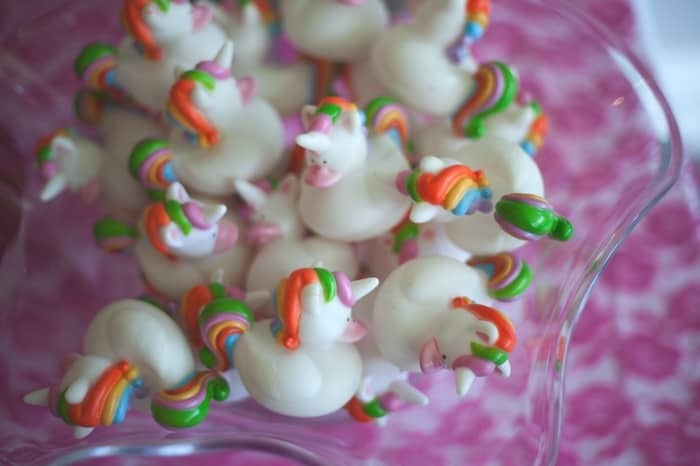 How quirky and fun are these Unicorn Rubber Duckies? 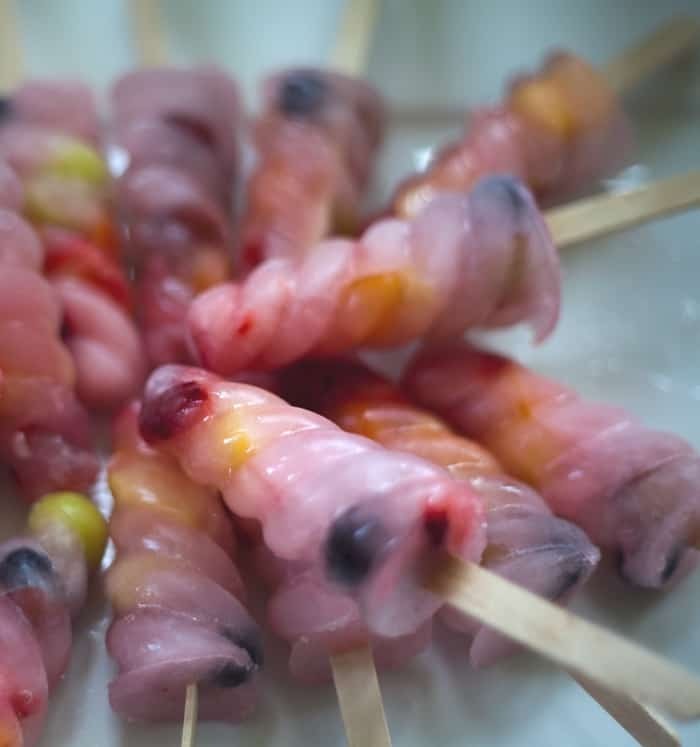 On Friday morning (48 hours before kick-off) I spotted these ice-pops on Elizabeth Street’s Pinterest, immediately searched for them online and had them shipped overnight. I don’t mess around when it comes to unicorn pops. 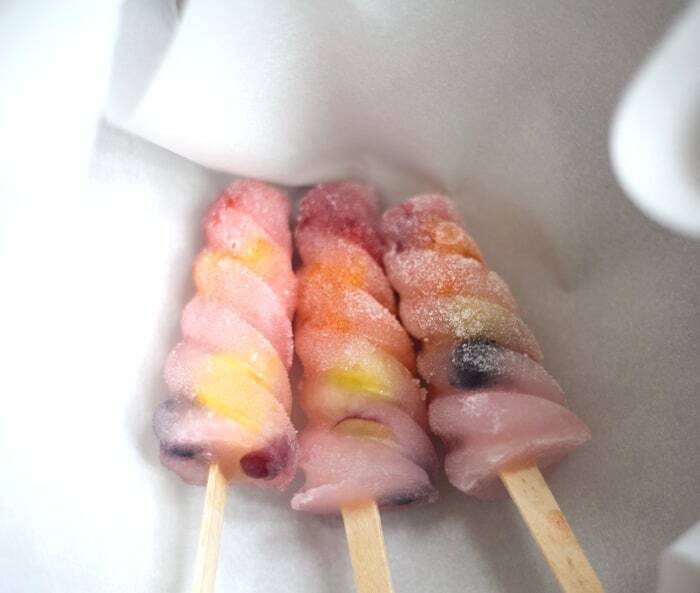 I asked you on Facebook for tips on quick freezing pops and our friend Macki sent me her Rainbow Fruit Pop recipe. I took the quick-freeze one step further and pre-froze my chopped fruit. 6 batches of pops in 18 hours! Nice! These are so delicious and refreshing. If your crew likes a little more sweet with their tart, give the frozen pops a roll in sugar. Unicorn horns of course. 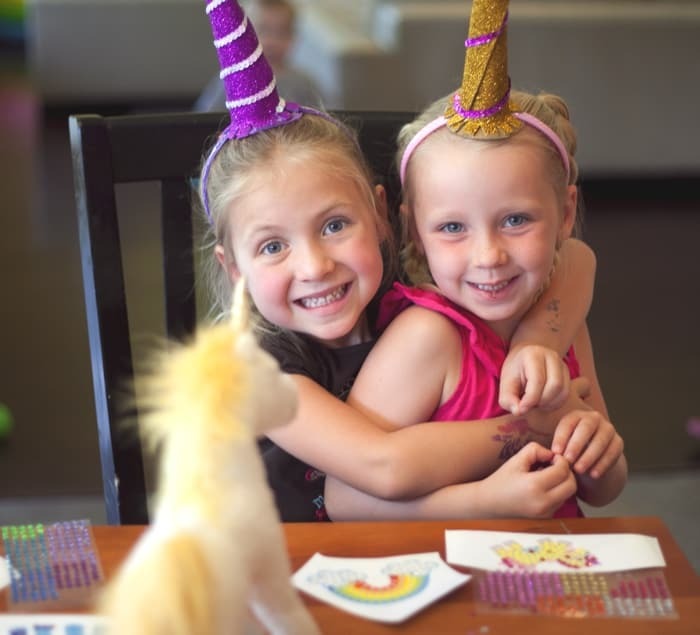 Here’s how to make DIY Unicorn Horn Party Hats Moms are telling me that everyone is still wearing them non-stop at home. Win. 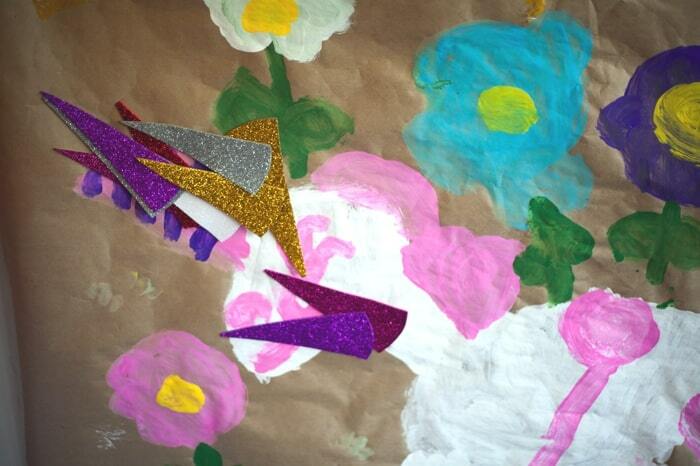 The pretty little stars filled with jewels were part of a scavenger hunt. 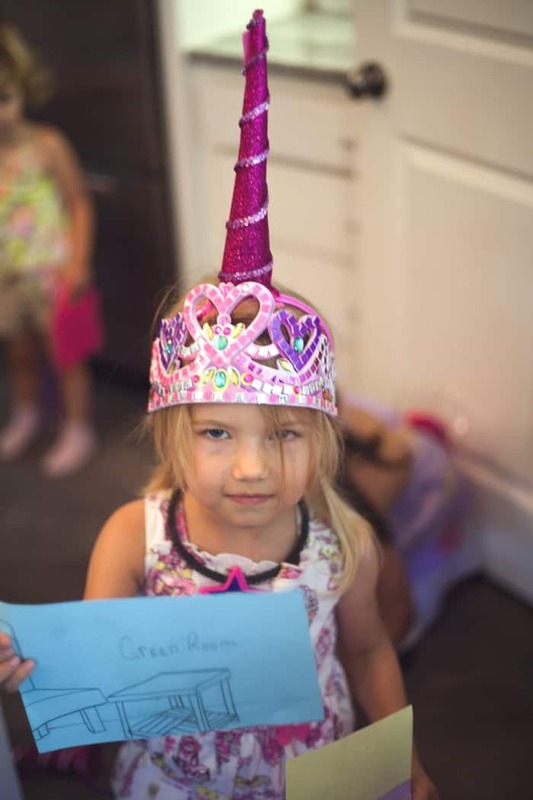 A series of clues led the band of unicorns around the house. 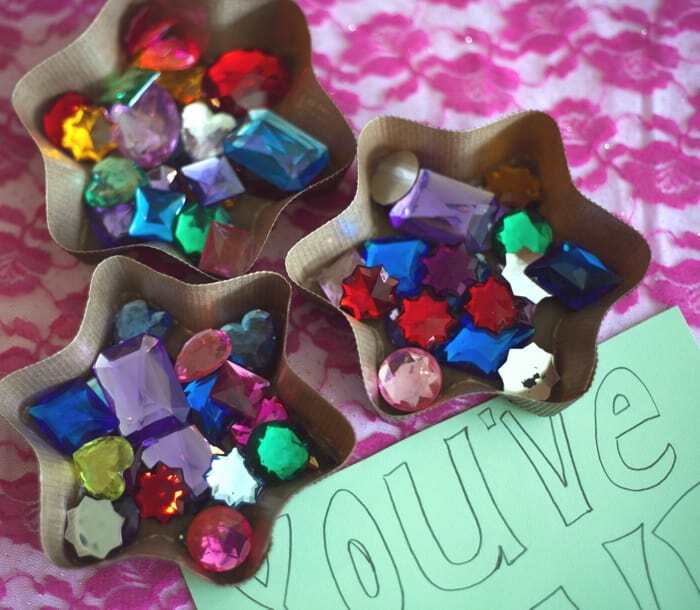 At every location there was cup of jewels for each girl to add a treasure to her bag. There were also tails, of course. 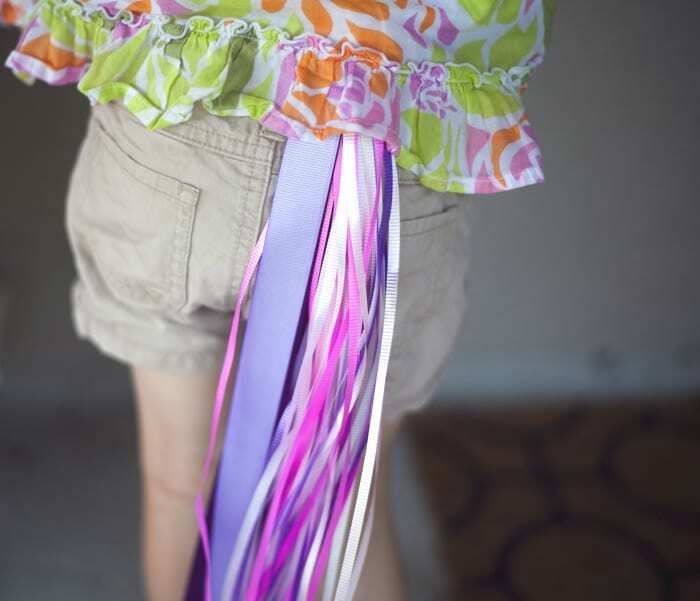 Simple bunches of ribbon and star wire tied to elastic waistbands. This was another fun project for Clare and I to do together. To make 24 ice pops with one mold, I had to use wooden sticks. To control drips, I made a small slit in the bottom of paper cupcake cups and slid them up the stick. 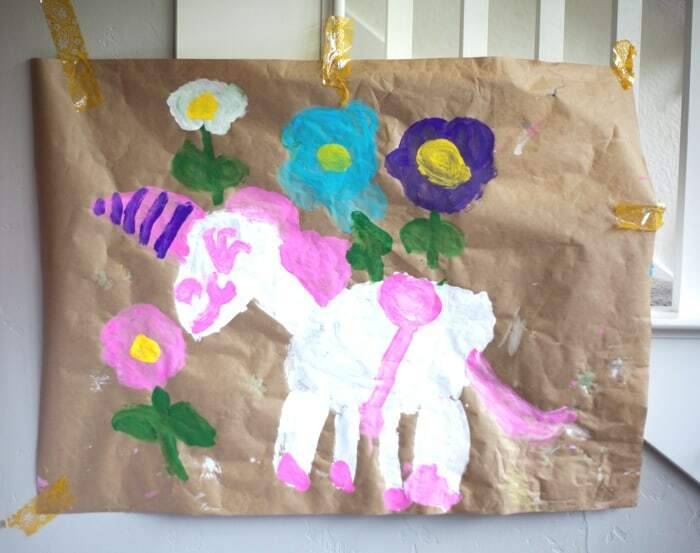 Clare painted this beautiful unicorn poster to play “pin the horn on the unicorn.” Unfortunately, if you use foam stickers for your horns, little girls who are geniuses will feel for the pieces already on the paper. Now I just feel silly. 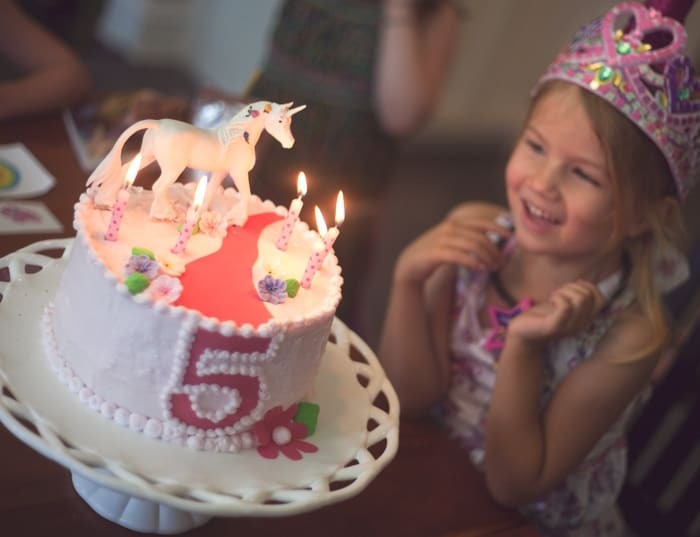 Clare loved her unicorn cake. I used our Evil Buttercream Icing recipe and How to Ice a Cake tutorial. The “5” the “river” and the flower are cut from Wilton Sugar Sheets. They. Are. Awesome. I plan to use them in many quick cake decorating projects. Thank you my precious unicorn princess. 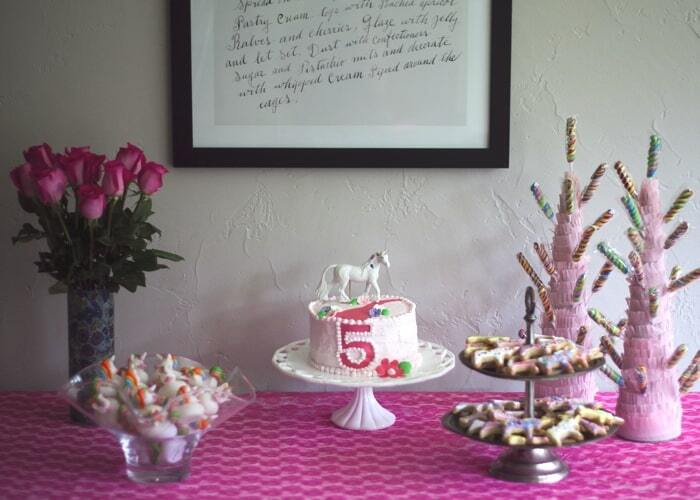 Planning a unicorn party has been a lifelong dream come true. 8-year-old Jacinda is impressed and yet totally jealous. so sweet! i haven’t tried the sugar sheets – better than fondant for cutting shapes out? how does it taste? The difference to me is that with fondant, it is dependent on the taste because typically you are replacing some/all of the buttercream. The sugar sheets are literally paper thin and you just lay it on top of the buttercream. It sort-of melts into the frosting and you don’t notice a taste/texture. I can’t wait to use the precut letters. So easy! I dont have any of the punches, I just cut it with scissors which was very easy. It would also be fun to write on them with food writers. I resisted for a year and will now definitely use them again. Oh.my.word! I’ve only just finished my 4yr olds rainbow party end of march and she too is now obsessed with unicorns! Fairy unicorns with wings to be precise actually! I’m not sure how my darling husband will be able to cope if I start planning this early out! I will have to let her pick the theme…a little bit closer to the time, but thank you SO much for the great ideas! I wouldn’t have known where to start – ill be saving this page for sure!! DIY please! The horns are too cute…but I wouldn’t know where to start! I have seen several unicorn headbands, but would like a list of supplies that you used since your blog entry stated the girls were wearing them after the party. Any durability is appreciated. Thanks. I also would like some hints on the unicorn headbands! I have figured out the actual horn, but am having trouble because they seem to be too top heavy? Maybe I need a wider headband? Help! I’d love a tutorial for the horns! This is so perfect timing. 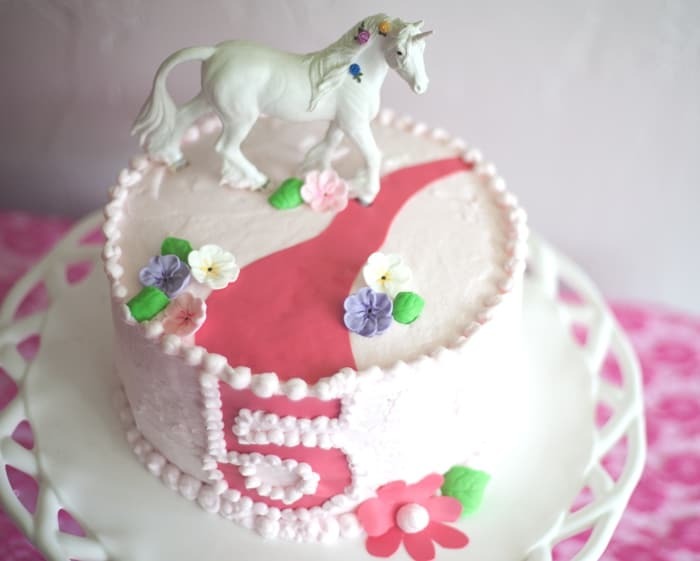 My Daughter is turning 5 and we’ll be having a party at the end of the month and she just informed me that she wants it to be all about unicorns. Yay, Thanks for the great ideas. Glad the Popsicle sticks & cupcake wrappers worked so well. We love these Popsicle makers! Such a great party! Do you have a tutorial for the cookies? I tried finding it on your web site, but I wasn’t successful. I love them! You are an amazing mommy! So, so, so cute!!! yes please a DIY for the horns! Great ideas on here! Thanks for posting! 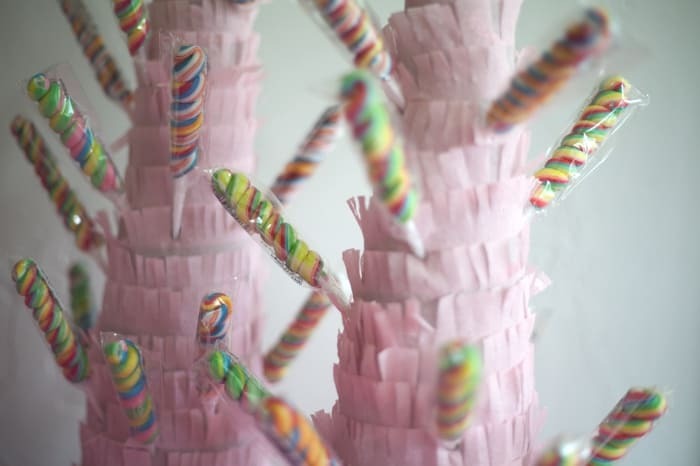 I love the sugar sheets ideas and thanks to you, will incorporate them into my soon-to-be 5 year old daughter’s magic forest/unicorn party cake! 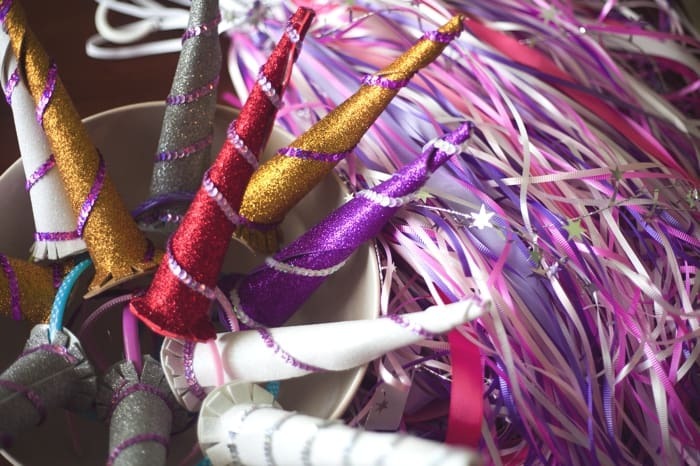 I am also making unicorn horns… and can let your readers know that you can buy pre-made party hats at Oriental Trading Company and roll them tight (they come in all colors, plain with no writing or design, and flat, with string). 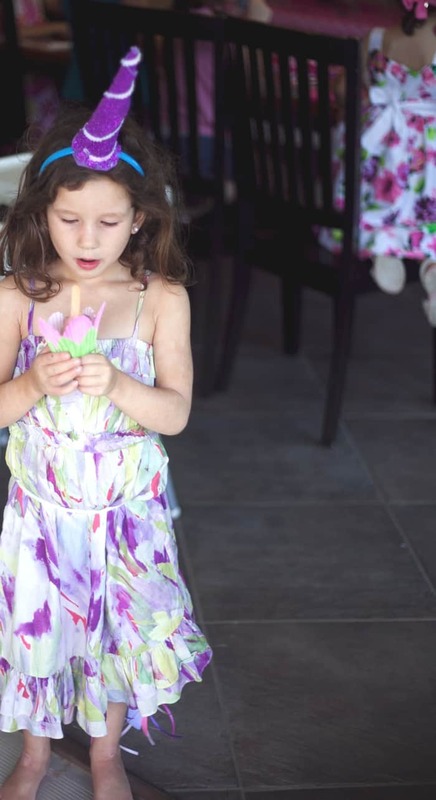 Once you’ve rolled them to the size you want, glue or tape them, then you can decorate them as you wish. I bought sequin trim and other sparkly ribbon at Michaels. Can not wait for this party! We’ve already done a Princess party, Fairy party, Mermaid/Under the Sea (to incorporate boy sharks) party, circus party, ninja party, and now the Magical Forest/Unicorn party (again to incorporate boys with girls.. boys can be dragons, gnomes, elves, or woodland creatures). Please send me the DIY instructions for the horns..
Could I get the DIY instructions for the horns? They look awesome!! I’d love a list of supplies for the unicorn horns. I might be able to figure it out if I knew what the horn was actually made out of? Anyone know? I’m clueless. Could you send me the DIY of the horns? Or the supply list? LOVE the horns, they are so cute and should be a great activity for kids. Glad I am not the only one who yes would need instructions on the horns.Could you please share.They would go great with my daughters rainbow party we are planning for her next birthday. It looks like the horns are made out of craft foam, probably the already sparkly kind. And then some sequin ribbon glued on. Glue the thing onto some dollar store plastic headbands and voila. Did I get it right? But what is the flat part on the bottom near the head? I would love the DIY instructions on the unicorn horn headbands! Thinking of a Goldilicious themed party for my little girl!!! 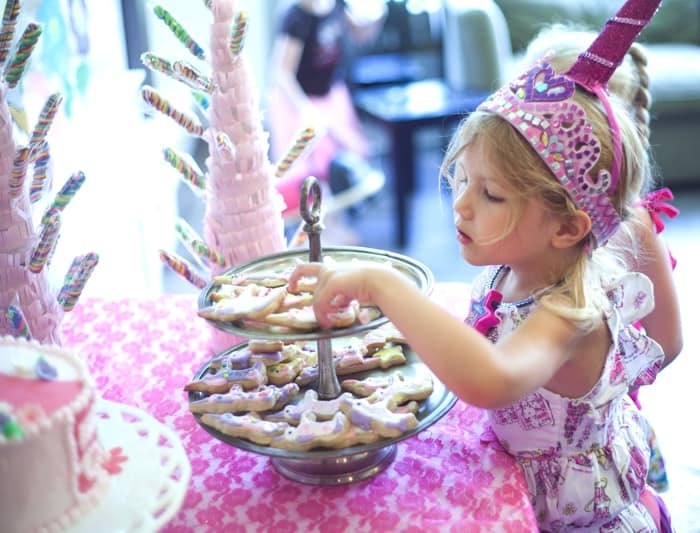 My 3 year old is already planning her next birthday (it’s not until November…). But this persistent child is already talking purple, sparkly unicorns! Your post has definitely provided some inspiration!! can you tell me how can I make the head bands? I made 3 dozen unicorn headbands for my daughter’s 5th birthday this past weekend. They were a TOTAL hit!! The kids took extra horns home to siblings. I bought plain plastic headbands from Oriental Trading. Then I bought a pack of glitter foam paper from Hobby Lobby and some plain foam paper without glitter for the circle under the headband. I twisted the glitter foam paper into a funnel and glued it together. I had to wrap rubber bands around it over night for the glue to dry. Then I cut the bottom so it would sit flat on the table. Then I cut half inch slits all around the base of the horn to create tabs. Next I cut a circle from the non-glitter paper the size of the base of the horn. I put the circle base under the headband and the horn on top of the headband then used the tabs to glue the horn and base together with the headband in the middle. I used barrettes to hold everything together until it was dry. They were very stable and the kids loved them. Thank you so much for the idea!!! How many horns were you able to do from each sheet? I used one sheet (8 1/2 x 11) per horn. 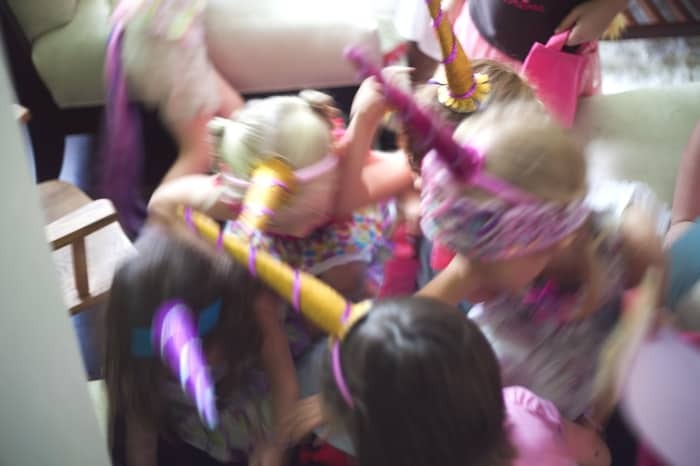 Hi there, firstly well done…what a wonderful party you organised for your gorgeous little girl…I am planning a magical rainbow unicorn party for my twin girls who are turning two in October and I simply LOVE your unicorn headbands…would you mind sharing how you made them???? I look forward to hearing from you …. Can you please send the horn instructions? Thanks! Thanks for the great idea! Please send me the unicorn horn instruction. Thx! I know it is a little late but can you send me a diy for the headbands. Thank you! Would love to see instructions about the horns! So cute! meal!! But yeah, thanx for spending some time to discuss this matter here on your site. Excellent goods from you, man. I’ve consider your stuff previous to and you are just extremely great. 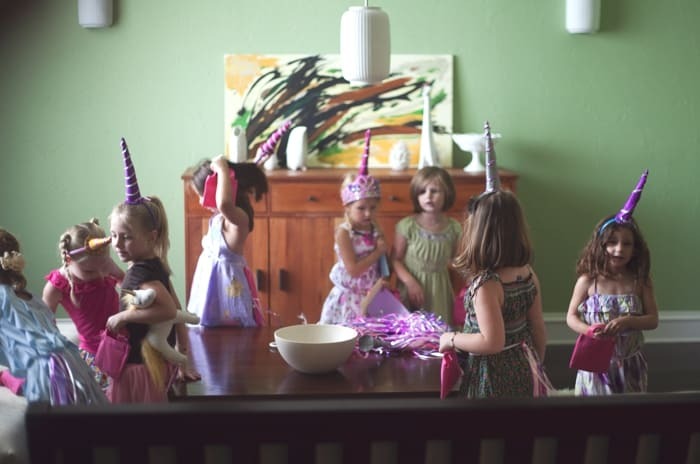 Please send me the DIY tutorial for the Unicorn Party Hats. I have never performed a DIY project like this before and need basic instructions that a first-time do-it-yourselfer can follow! The hats are perfect for my daughters upcoming 4th birthday party! I’d love the tutorial on the unicorn hats, please. Preparing for my daughter’s 5th birthday. Thanks! 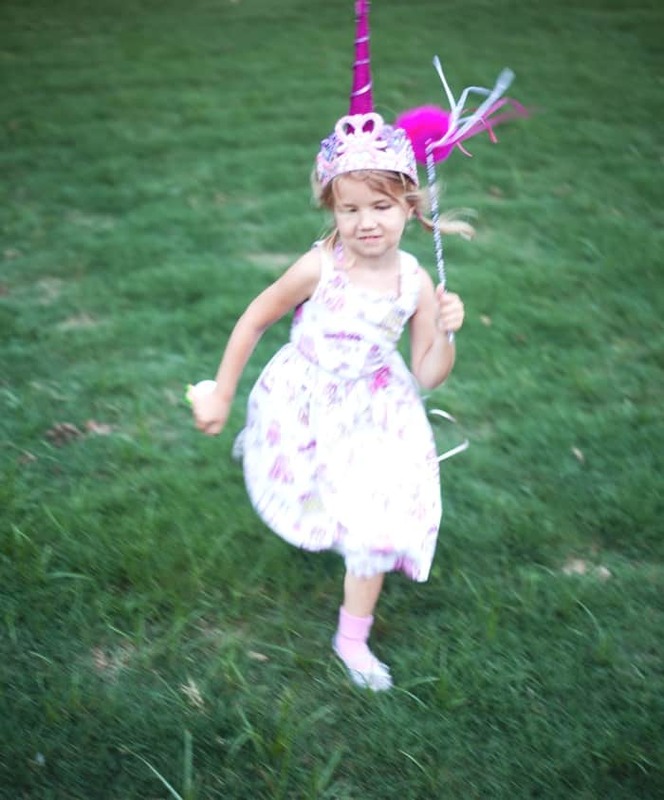 May I also please get the DIY instructions for the unicorn headbands…they are awesome! be redirecting to a completely different web-site when I click the homepage link. I would love your DIY instructions for the unicorn headbands if you’re willing to pass them along. 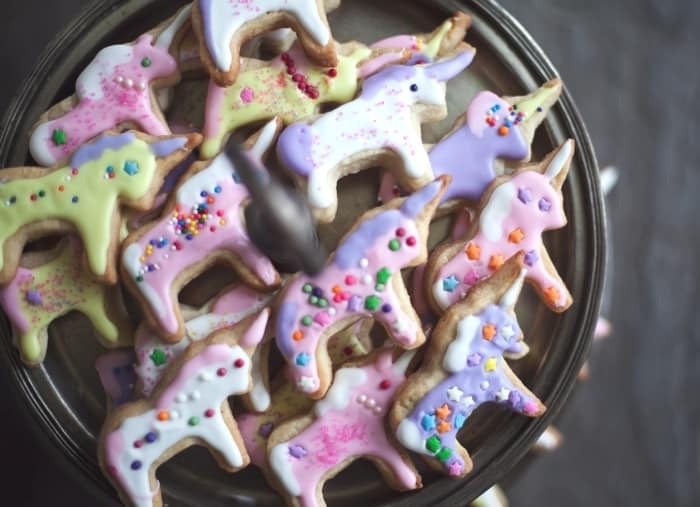 A unicorn party is being requested by my very soon to be 6 yr old and those are so cute! Could I get the diy tutorial on the unicorn headband/hats? So cute!!!! Better late (um, by three years) than never! I posted a tutorial for the horns today. I can’t find the link for the ice pops. Could I get the recipe please?